The mystery of who provided the National Enquirer with information about the romance between Bezos and Lauren Sanchez, has sparked much intrigue. Bezos launched an investigation into the matter, and the person leading that investigation has said evidence suggests it was a politically motivated leak. Bezos, in a blog post last week, suggested that either President Donald Trump or the kingdom of Saudi Arabia had possibly played a role, or that National Enquirer may have acted to curry favor with them. Since then, two other news organizations have reported that Michael Sanchez, Lauren Sanchez’s brother, was the initial tipster. The Daily Beast, citing sources at the National Enquirer’s parent company, American Media Inc., reported Sunday that Michael Sanchez was the tabloid’s source. The Associated Press reported Tuesday that Bezos’ investigation had concluded Michael Sanchez leaked private text messages between the Amazon founder and Lauren Sanchez. Michael Sanchez declined on Wednesday to provide CNN an on-the-record comment about whether he was the leaker. He previously denied to The Washington Post playing a role in leaking details about the relationship between Bezos and his sister, and told The New York Post he would not dignify such allegations with a response. The suggestions about whether Trump or Saudi Arabia possibly played a role in exposing the relationship have gone unsubstantiated since Bezos first made them in a blog post last week detailing his interactions with the National Enquirer. Last Thursday, Bezos wrote in a Medium post that the National Enquirer and AMI had tried to blackmail him using explicit photos he had sent Lauren Sanchez which the tabloid said it obtained. In the blog post, Bezos dangled tantalizing details in front of the reader, mentioning both Trump and Saudi Arabia. Bezos wrote that his ownership of The Washington Post, which has covered both Trump and the Saudi Arabian government critically, was a “complexifier” for him. In effect, Bezos suggested — though he did not outright say — that the Saudis or Trump, or perhaps both, had possibly played a role in exposing his relationship to the National Enquirer. But six days later, Bezos has not provided any evidence to support those ideas. And while he did provide emails to support his allegation of blackmail, the absence of evidence on the other explosive suggestions has only increased interest in the matter. But it seems that AMI did want to have ties to Saudi Arabia. 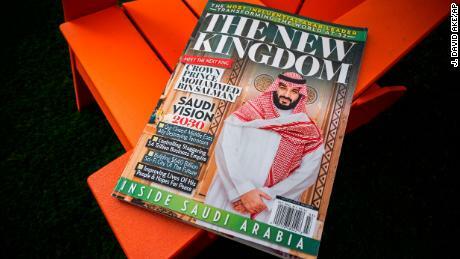 Elkan Abramowitz, a lawyer for AMI chief executive David Pecker, told ABC News that the company had sought financing from the Saudis, but “never obtained any.” The company inexplicably printed a glossy magazine promoting the kingdom in 2018, when ascendant crown prince Mohammed bin Salman was visiting the US and meeting with business leaders. And Pecker took a guest with ties to the Saudi government to a White House dinner in July 2017, according to The New York Times. “American Media does not have, nor have we ever had, any editorial or financial ties to Saudi Arabia,” a spokesman for the company told CNN earlier this week in response to questions on the matter. There are also well-known ties between Trump and AMI. Pecker and Trump are longtime friends and during the 2016 election the Enquirer often targeted Trump’s political opponents, while providing him with glowing coverage. The Enquirer also engaged in a tactic called “catch and kill,” paying for the rights to embarrassing stories about Trump, and then never publishing them. Pecker was granted immunity last summer to provide federal investigators information on such hush money deals. The person leading Bezos’ investigation into the matter, Gavin de Becker, told The Daily Beast on Sunday that the first stage of his investigation has been completed. That part of the investigation, he said, focused on who leaked the text messages between Bezos and Lauren Sanchez to the National Enquirer and why. While de Becker said he turned over that information to Bezos’ attorneys, he has declined to reveal to the public any details about what his investigation found. The Daily Beast reported that it had reviewed documents related to the investigation, but it was not clear if the documents were from de Becker’s investigation. De Becker had previously been quoted in The Daily Beast saying “strong leads” in his investigation into the leak of text messages to the National Enquirer “point to political motives.” He told The Washington Post it was a “politically motivated” leak aimed at embarrassing Bezos. In both instances, de Becker did not appear to provide any evidence supporting his statements. De Becker did not provide CNN an on-the-record comment, despite multiple requests. An Amazon representative also declined to comment, noting the questions did not pertain to the company. Bezos does not have any other known spokespeople representing him. Among the questions CNN asked de Becker and the Amazon spokesperson were: Why did Bezos mention the Saudis and Trump in his blog post? ; What were the findings of de Becker’s investigation? ; Will Bezos ever share with the public information about de Becker’s investigation? In Bezos’ initial Thursday blog post, he shared an email from Dylan Howard, the National Enquirer’s chief content officer. Howard, in that email, detailed the various photos he said the tabloid “obtained during our newsgathering.” Those photos included what Howard described as a “‘below the belt selfie — otherwise colloquially known as a ‘d*ck pick'” and other explicit photos of both Lauren Sanchez and Bezos. Michael Sanchez insisted to CNN on Tuesday — before CNN’s reporting that he was the National Enquirer’s initial source — that he was told that the investigation “cleared” him of “any involvement” related to photos involving Bezos’ genitalia. He said that he was provided the information by a third party with knowledge of the investigation, and that he had not been directly told he had been cleared by investigators. “I have been told that the Amazon investigation determined that I was not involved in the leak of the d*ck pics, because I never had access to any of the d*ck pics,” he told CNN. Michael Sanchez on Tuesday also cast doubt on the rigor of de Becker’s investigation, telling CNN that throughout the course of the investigation de Becker “never asked to examine my phone, laptop or notes” or “identified himself to me as an investigator.” He suggested that Bezos’ suggestion the Saudis or Trump possibly played a role in the leaking of the text messages to the National Enquirer was an attempt to distract. If Bezos does not ultimately provide the public with more details or evidence supporting the suspicions he and de Becker appear to have, it’s possible federal authorities might. According to two people familiar with the matter, prosecutors with the U.S. Attorney’s Office for the Southern District of New York are examining the conduct of the National Enquirer and how the tabloid handled its reporting into Bezos. Previous articleIf you’ve ever dreamed of cruising on a private jet, sipping champagne and dinning with the love of your life, this is your chance to make it happen! A Valentine’s Day offer you don’t want to miss! Hurry!! !